Enjoy a uniquely personal navigation experience with the elegantly slim Garmin nuvi 3790T. A sat nav with style, substance and personality and just 8.77mm thin, it redefines portable navigation to watch over your every journey. Garmin nuvi 3790T features a gesture-controlled multi-touch display, viewable in portrait or landscape, nuRoute technology with trafficTrends and myTrends, voice-activated navigation, 3D buildings and terrain, lane assist with PhotoReal Junction View, full European maps for 44 countries with 60-day nuMaps Guarantee, hands-free calling and subscription-free pan-European lifetime traffic alerts. Garmin nuvi 3790T has been discontinued. Accessories, spares and parts are still available for your nuvi 3790T, as are road maps. Elegantly manufactured in aluminium and chrome, the blade-like Garmin nuvi 3790T is the slimmest portable navigator on the market, with a highly-responsive, high-detail 800x400 pixel 4.3-inch LCD display. A sat-nav first, the capacitive multi-touch technology lets you “slide”, “tap” and “pinch” to zoom in and out and browse surrounding areas just by dragging a finger on the gesture-controlled screen, Duel-orientation capabilities mean you can choose how you see the route ahead – simply flip Garmin nuvi 3790T portrait-to-landscape while walking or in the car to view any way you want. Garmin nuMaps Guarantee - simply register your new Garmin nuvi 3790T within 90 days of first using your sat-nav to see if a free map update is available. See map coverage below for more details. The ultra-intelligent Garmin nuvi 3790T sat nav is tailored to your needs to find you the best route. Advanced routing capabilities include nuRoutes myTrends, which analyses your driving behaviour and predicts your regular journeys and trafficTrends, which automatically learns traffic flow trends to improve your routes and predict journey time using traffic knowledge learned from other drivers combined with live traffic alerts. Experience completely voice-controlled navigation from the word ‘go’. Simply set your own custom “wake-up” command to activate speech-recognition mode and Garmin nuvi 3790T acts on your spoken instruction for totally hands-free navigation. Give Garmin nuvi 3790T a name, tell her where you want to go and she’ll design a route specifically for you. You can even give her a new voice. Just use the freeGarmin Voice Studio software and let your sat nav come alive. Navigate tricky junctions with PhotoReal junction view for accurate images of upcoming exits and junctions on your route. Garmin nuvi 3790T shows your correct lane choice with incredible detail of what’s up ahead - down to the trees, bridges and pylons. See the precise reproduction of road signs with arrows guiding you to the right lane for your onward journey. Flip Garmin nuvi 3790T landscape-to-portrait to see PhotoReal junction view in split-screen for exceptional clarity. The road ahead has never looked so vivid. Drive safely and legally with speed camera alerts relevant to your direction of travel, speed and route provided by dedicated safety camera company - Cyclops. Speed cameras are continually and automatically updated so there are no surprises on route. Garmin nuvi 3790T’s unique speed camera warning system gives real-time, reliable, and accurate alerts for fixed, average speed, mobile and temporary cameras. Garmin nuvi 3790T integrates Bluetooth wireless technology with a built-in microphone and speaker letting you make hands-free calls while giving the road your full attention. Simply dial numbers on the touchscreen or tap the display and speak into the built-in microphone to take incoming calls. Enjoy convenient one-touch dialling of your phone book contacts and points of interest, all with enhanced sound quality though the dedicated car mount loud speaker. Steer clear of traffic with the integrated FM traffic receiver and subscription-free, pan-European lifetime¹ traffic updates. Receive alerts about traffic delays and roadwork's that lie ahead on your route. Next, simply touch the screen on Garmin nuvi 3790T to view traffic details or detour around the problem area. With enhanced pedestrian navigation capabilities and dual-oriented screen, Garmin nuvi 3790T is your perfect travel companion. Download optional cityXplorer maps to plan the whole journey with pedestrian routes and public transport across Europe. Garmin nuvi 3790T has an intuitive interface that greets you with two simple questions: "Where To?" and "View Map." Touch the colour screen to easily look up addresses and services and get voice-prompted, turn-by-turn directions that speak street names to your destination It comes preloaded with detailed City Navigator NT street maps for 44 countries across Europe with over a million points of interest (POIs) such as shops, restaurants, hotels, entertainment venues, petrol stations, cash points and more and speed limits for most major roads. With 3D Building and Terrain view, you’ll see representations of prominent buildings in many cities and map contours at low zoom levels, giving you a realistic perspective of your journey. Besides the advanced features you’d expect from a flagship Garmin sat nav, Garmin nuvi 3790T goes beyond navigation. The ecoRoute fuel-saving feature calculates a more fuel-efficient route, tracks fuel usage and enables expense reporting through Microsoft Excel. Plug in the optional ecoRoute HD device for engine diagnostics. Garmin nuvi 3790T is packed with travel tools including a JPEG picture viewer, world travel clock with time zones, currency converter, measurement converter, calculator and more. With photo navigation, you can download pictures from Garmin Connect Photos and navigate straight to the scene. Visit the Garmin Garage to download custom voices and vehicles for free and enhance your travel experience further with optional plug-in AA City Guides and other Garmin Extras. Record a new voice for your Garmin for uniquely personal navigation with free Garmin Voice Studio software. Garmin nuvi 3790T has been designed to be plug and play, and as such can be transferred from vehicle to vehicle with ease. The Garmin nuvi 3790T is powered via the supplied vehicle power cable. The Garmin nuvi 3790T then attaches to your vehicles windscreen via the Garmin nuvi 3790T suction cup mount with speaker. Alternatively using the supplied dashboard disk you can mount the suction cup mount on top of your dashboard instead. Garmin nuvi 3790T comes preloaded with detailed City Navigator street maps for the UK, Ireland, Western and Eastern Europe (44 countries) provided from map supplier NAVTEQ. Rolling screen transition, accelerated map redraw and routing capabilities make screen zooming even smoother and ensure the navigation always matches your pace. Looking for accessories and spares for the Garmin nuvi 3790T? View the full range. All parts are genuine Garmin product and specifically designed for use with the nuvi 3790T. Accessories available to purchase include a slip case, mains power charger and weighted dashboard mount. Along with these accessories, it's also possible to buy replacement parts such as suction cup mount and vehicle charger. 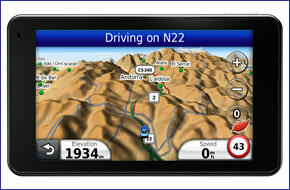 Looking for sat nav maps for the Garmin nuvi 3790T view them all here. All mapping comes on microSD card with SD card adaptor and is genuine Garmin product and specifically designed for use with the nuvi 3790T. Countries available to buy include: South America, Eastern Africa and South East Asia.